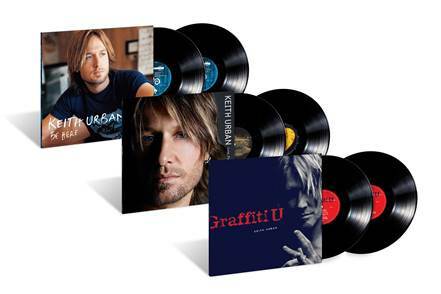 Keith Urban’s albums, Be Here, Love, Pain & the Whole Crazy Thing, and his latest Graffiti U are available now on vinyl for the first time ever via Capitol Nashville/UMe. The albums join the already-available Urban LPs Fuse, Get Closer and Golden Road, all of which were first released on vinyl in 2016, making Urban’s entire album catalog now available to vinyl listeners. The three hit-filled albums are pressed on standard weight black vinyl and have all been expanded to 2LPs to present the music in the highest quality.